The duration of sleep varies dramatically between species, yet little is known about the genetic basis or evolutionary factors driving this variation in behavior. The Mexican cavefish, Astyanax mexicanus, exists as surface populations that inhabit rivers, and multiple cave populations with convergent evolution on sleep loss. The number of Hypocretin/Orexin (HCRT)-positive hypothalamic neurons is increased significantly in cavefish, and HCRT is upregulated at both the transcript and protein levels. Pharmacological or genetic inhibition of HCRT signaling increases sleep in cavefish, suggesting enhanced HCRT signaling underlies the evolution of sleep loss. Ablation of the lateral line or starvation, manipulations that selectively promote sleep in cavefish, inhibit hcrt expression in cavefish while having little effect on surface fish. These findings provide the first evidence of genetic and neuronal changes that contribute to the evolution of sleep loss, and support a conserved role for HCRT in sleep regulation. Sleep behavior is nearly ubiquitous throughout the animal kingdom and is vital for many aspects of biological function (Campbell and Tobler, 1984; Hartmann, 1973; Musiek et al., 2015). While animals display remarkable diversity in sleep duration and architecture, little is known about the functional and evolutionary principles underlying these differences (Allada and Siegel, 2008; Capellini et al., 2008; Siegel, 2005). We previously discovered the convergent evolution of sleep loss in the blind Mexican cavefish, Astyanax mexicanus (Duboué et al., 2011). Relative to extant conspecifics that inhabit caves, independently derived cave-dwelling populations display a striking 80% reduction in total sleep with no adverse impacts on health or development (Duboué et al., 2011). The robust differences in sleep between surface and cave populations provide a unique model for investigating the genetic basis for sleep variation and identification of novel mechanisms underlying the evolution of sleep regulation. Astyanax mexicanus consists of eyed surface populations that inhabit rivers in the Sierra del Abra region of Northeast Mexico, and at least 29 distinct populations of cavefish in this region (Mitchell et al., 1977). Cavefish are derived from surface ancestors, which arose from colonization events that are estimated to have taken place within the past 2–5 million years (Gross, 2012; Jeffery, 2009; Keene et al., 2015). Independently-evolved cave populations of A. mexicanus share morphological and developmental phenotypes including smaller or completely absent eyes, and loss of pigmentation (Borowsky, 2008a; Gross and Wilkens, 2013; Protas et al., 2006). In addition, cavefish display an array of behavioral changes including reduced schooling, enhanced vibration attraction behavior, hyperphagia, and sleep loss (Aspiras et al., 2015; Duboué et al., 2011; Kowalko et al., 2013; Yoshizawa et al., 2010). Convergent evolution of shared traits in independent cavefish populations, combined with robust phenotypic differences with extant surface fish populations, provides a system to examine how naturally occurring variation and evolution shape complex biological traits. While the ecological factors underlying phenotypic changes in cave populations are unclear, food availability and foraging strategy are hypothesized to be potent drivers of evolutionary change that contribute to the variation in sleep duration across animal species (Siegel, 2005). Many cave waters inhabited by A. mexicanus are nutrient poor compared to the above-ground rivers surrounding them (Mitchell et al., 1977), and previous field studies suggest cavefish subsist primarily off of bat guano, small insects, and organic matter washed into the cave by seasonal floods (Keene et al., 2015; Mitchell et al., 1977). Following starvation, cave-derived fish have a slower rate of weight loss compared to surface conspecific, suggesting that a reduced metabolism may account, in part, for adaptation to cave life (Aspiras et al., 2015). We previously found that sleep is increased in cavefish during periods of prolonged starvation, raising the possibility that cavefish suppress sleep to forage during the wet season when food is plentiful, and increase sleep to conserve energy during the dry season when food is less abundant (Jaggard et al., 2017). Therefore, sleep loss in cavefish appears to be an evolved consequence of changes in food availability, providing a model to examine interactions between sleep and metabolism. Despite the robust phenotypic differences in sleep between A. mexicanus surface and cave populations, little is known about the neural mechanisms underlying the evolution of sleep loss in cavefish. Many behaviors that are altered in cavefish are regulated by the hypothalamus, which is enlarged in cavefish (Menuet et al., 2007). Here, we investigate the role of Hypocretin/Orexin (HCRT), a highly conserved hypothalamic neuropeptide known to consolidate wakefulness. Deficiencies in HCRT signaling are associated with altered sleep and narcolepsy-associated phenotypes in diverse vertebrate organisms (Appelbaum et al., 2009; Chemelli et al., 1999; Faraco et al., 2006; Lin et al., 1999; Prober et al., 2006; Yokogawa et al., 2007). In zebrafish, HCRT is critical for normal sleep-wake regulation. Ectopic expression of hcrt increases locomotor activity, while ablation of HCRT neurons increases daytime sleep (Elbaz et al., 2012; Prober et al., 2006; Singh et al., 2015). We now show that HCRT expression is down-regulated in cavefish in response to sleep-promoting manipulations including starvation and ablation of the lateral line (Jaggard et al., 2017). Further, pharmacologic or genetic disruption of HCRT signaling selectively restores sleep to cavefish but not surface fish. Together, these findings suggest plasticity of HCRT function contributes to evolved differences in sleep regulation in Mexican cavefish. Sleep is dramatically reduced in adult Pachón cavefish compared to surface fish counterparts (Figure 1A,B) (Jaggard et al., 2017; Yoshizawa et al., 2015). We compared sequence homology between surface fish and cavefish by a bioinformatic analysis of the sequences from the cavefish genome (McGaugh et al., 2014) and available full-length transcriptomic sequences (Gross et al., 2013). Alignment of the HCRT neuropeptide reveals that A. mexicanus shares high sequence similarity to other fish species (35–48% percent identity) and mammals (35% percent identity), including conservation of domains that give rise to the HCRT neuropeptides (Figure 1—figure supplement 1A). The HCRT peptide sequences of surface and Pachón cavefish are identical (100% percent identity). To determine if hcrt expression is altered in adult cavefish, we measured transcript levels in whole-brain extracts with quantitative real-time PCR (qPCR). Expression of the housekeeping gene, GAPDH, was comparable between both forms (Figure 1—figure supplement 1B). By contrast, hcrt expression was significantly elevated in Pachón cavefish to over three-fold the levels of surface fish, raising the possibility that upregulation of hcrt underlies the evolution of sleep loss (Figure 1C). Neuropeptide levels were quantified by immunolabeling serial-sectioned brains, and examining the number of HCRT-positive cell bodies and the relative fluorescence of each cell under fed conditions (Figure 1—figure supplement 2A–D). The number of HCRT-positive cell bodies was significantly higher in Pachón cavefish compared to surface fish (Figure 1D). Further, quantification of fluorescence intensity of individual cells revealed increased HCRT neuropeptide in cavefish (Figure 1E–I). Enhanced levels of HCRT protein were also observed in five day post fertilization (dpf) larvae, suggesting the change in peptide levels were present at the time fish begin consuming food (Figure 1—figure supplement 3). While mammals possess two HCRT receptors (HCRTR1 and HCRTR2), zebrafish only possess HCRTR2 (Prober et al., 2006; Yokogawa et al., 2007). Importantly, HCRTR2 is proposed to be evolutionarily more ancient compared to HCRTR1 (Wong et al., 2011). We performed genome analysis to explore how many paralog HCRTR genes resided in the genome of A. mexicanus, and found the cavefish and surface fish genomes encode only HCRTR2 (McGaugh et al., 2014). To more directly assess the contributions of HCRT regulation in sleep loss, we measured the effect of HCRT receptor blockade on sleep in adult surface fish and Pachón cavefish. Fish from both populations were bathed in the selective HCRTR2 pharmacological inhibitor, TCSOX229 (Kummangal et al., 2013; Plaza-Zabala et al., 2012). Sleep in surface fish remained unchanged in the presence of 1 μM or 10 μM TCSOX229 (Figure 2A,C). Conversely, treatment of TCSOX229 in Pachón cavefish increased sleep duration compared to solvent treated (DMSO) controls (Figure 2B,C). While these results do not exclude the possibility that HCRT regulates sleep in surface fish, the sleep-promoting effect of TCSOX229 in Pachón cavefish suggests these fish are more sensitive to changes in HCRT signaling than surface fish. Treatment with TCSOX229 had no effect on waking velocity in surface fish or cavefish, suggesting that the increased quiescence observed in cavefish after drug treatment is not due to lethargy (Figure 2D). Further analysis revealed that sleep-promoting effects of TCSOX229 in cavefish can be attributed to both an increase in bout number and bout duration, suggesting that HCRT blockade affects sleep onset and maintenance (Figure 2E,F). Taken together, these findings support the notion that elevated HCRT signaling in cavefish underlies, in part, the evolution of sleep loss. Sleep loss in A. mexicanus cavefish populations is found across developmental stages, from larval and juvenile forms to adults (Duboué et al., 2011; Yoshizawa et al., 2015). The small size of young fry (25 dpf) and ability to perform higher throughput analysis make them an excellent model for investigating the effects of drugs on sleep. Previous drug screens have been carried out using larval and juvenile zebrafish and A. mexicanus using standard concentrations between 1–30 µM for all drugs (Duboué et al., 2011; Rihel et al., 2010). We therefore selected additional pharmacological modulators of HCRTR2 based on permeability to the blood-brain barrier and affinity for HCRTR for testing in fry. Fish from both populations were bathed in the selective HCRTR2 pharmacological inhibitors, TCSOX229 (Kummangal et al., 2013; Plaza-Zabala et al., 2012), N-Ethyl-2-[(6-methoxy-3-pyridinyl) [(2-methylphenyl)sulfonyl]amino] -N-(3-pyridinylmethyl)- acetamide (EMPA) (Malherbe et al., 2009; Mochizuki et al., 2011), or the HCRTR1/2 antagonist Suvorexant (Betschart et al., 2013; Hoyer et al., 2013) (Figure 3A). A dose-response assay was carried out in juvenile fish for TCSOX229 (Figure 3—figure supplement 2) and found a significant effect in Pachón cavefish at a concentrations ranging from 1 to 30 µM. Therefore, all three antagonists were tested for their effect on sleep in surface and cavefish at a dose of 30 µM. None of the three antagonists altered sleep in surface fish, whereas they significantly increased sleep in cavefish (Figure 3B) at this concentration. The waking activity was not affected by antagonist treatment in surface fish or cavefish, supporting the notion that the sleep promoting effects on cavefish are not due to induction of lethargy (Figure 3C). Further, all three HCRT antagonists significantly increased sleep bout number, and bout duration in cavefish (Figure 3D,E). 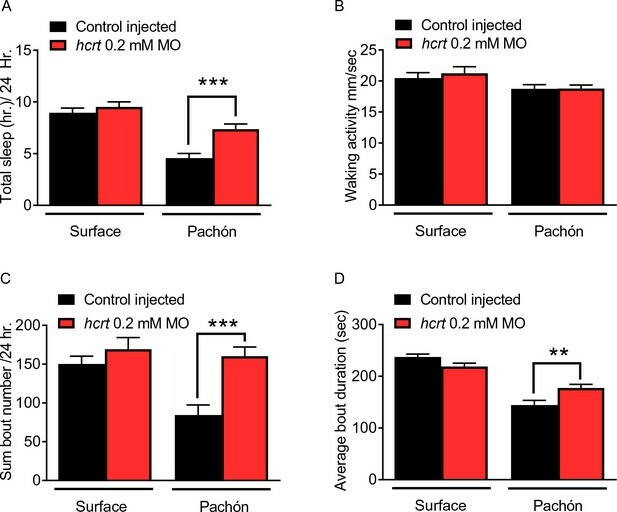 While these results do not exclude the possibility that HCRT regulates sleep in surface fish, the sleep-promoting effect of HCRT antagonists in Pachón cavefish suggests these fish are more sensitive to changes in HCRT signaling than surface fish. To determine the role of enhanced HCRTR2 signaling, we bathed 25 dpf fry in the HCRTR2 selective agonist YNT-185 (Figure 3—figure supplement 1). 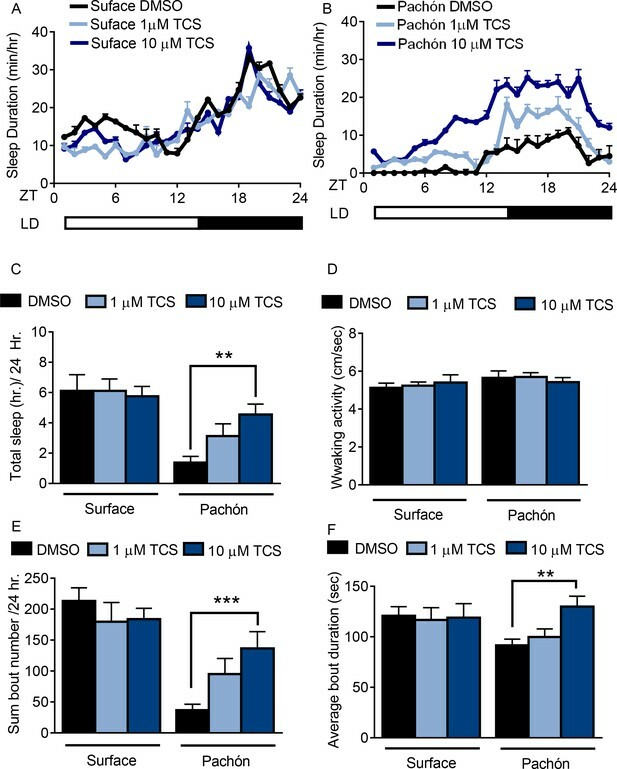 While the effect of this drug on sleep has not been previously tested in fish, it actively consolidates wakefulness in mice (Irukayama-Tomobe et al., 2017; Nagahara et al., 2015). Treatment with YNT-185 significantly reduced sleep in surface fish, without affecting sleep in cavefish where HCRT levels are naturally elevated (Figure 3—figure supplement 1 ). Activity during waking bouts was not significantly altered with treatment of YNT-185 in either surface or Pachón cavefish, suggesting that the reduction in total sleep of surface fish was not due to lethargy. Further, YNT-185 treatment significantly reduced the total number of sleep bouts (Figure 3—figure supplement 1). Taken together, these findings support the notion that elevated HCRT signaling in larval and adult cavefish underlies the evolution of sleep loss. To validate the sleep phenotypes obtained with pharmacological manipulation of HCRT signaling, we selectively knocked-down hcrt and measured the effect on sleep. Morpholinos (MOs) have been effectively used in zebrafish and A. mexicanus to knock-down gene function (Bilandžija et al., 2013; Bill et al., 2009). The knock-down effect of MO injection is typically limited to ~five days post injection, and we first verified that sleep differences are present at this early stage. We found that at four dpf, sleep in Pachón cavefish is significantly reduced compared to surface fish that were age-matched (Figure 4A). Injection of 0.2 mM hcrt MO enhanced sleep in cavefish compared to fish injected with scrambled MO control, whereas knock-down of hcrt using the same MO had no observable effect on surface fish (Figure 4A). The mortality of fish injected with 0.2 mM hcrt MOs, 0.2 mM scramble MOs, and non-injected controls did not differ, indicating at the concentration used, there is no generalized effect of injection procedure or MO treatment on survival (Figure 4—figure supplement 1A–B). While this baseline mortality is higher than zebrafish, it does not differ from standard A. mexicanus mortality observed in our lab or others, and therefore there does not appear to be a detrimental effect of injection procedure or treatment (Elipot et al., 2014). Morpholino treatment did not affect activity during wake bouts in surface fish or Pachón cavefish (Figure 4B). Analysis of sleep architecture revealed that injection of 0.2 mM hcrt MO increased total sleep bout number and sleep bout duration in Pachón cavefish, though not to levels of surface fish(Figure 4C; Figure 4D). Therefore, these findings support the notion that elevated levels of HCRT promote sleep in Pachón cavefish. To validate further a role for HCRT in sleep regulation we sought to genetically silence HCRT neurons and assess sleep. The GAL4/UAS system has been widely in Drosophila and zebrafish to manipulate gene expression with spatial specificity (Asakawa and Kawakami, 2008; Brand and Perrimon, 1993; Scheer and Campos-Ortega, 1999). In zebrafish, co-injection of separate GAL4 and UAS plasmids flanked with the transposable element, Tol2 (Kawakami et al., 2000), has been effectively used to generate transient or stable expression in cells labeled by both transgenes (Scott et al., 2007). To silence HCRT neurons, we co-injected embryos with hcrt-GAL4 that drives expression in all HCRT neurons and UAS-Botulinum toxin (BoTX) that blocks neurotransmission by cleaving SNARE proteins required for synaptic release (Brunger et al., 2008). Embryos were injected, raised under standard conditions, then tested for sleep at 25 dpf. Following sleep measurements, brains of individual fish were dissected and the number of silenced HCRT neurons (identifiable by GFP expression) were quantified. In all cases, no expression was observed in fish injected with UAS-BoTXBLC-GFP alone, indicating that hcrt-GAL4 is required for driving expression of the transgene (Figure 5A,C). Further, all GFP-positive neurons were co-labeled by Anti-HCRT, demonstrating that this approach specifically targets BoTXBLC transgene expression to HCRT neurons (Figure 5B,D). The total sleep in fish expressing hcrt:GAL4; UAS-BoTxTxBLC-GFP were compared to wild type fish or fish injected with UAS-BoTxTxBLC-GFP alone. Sleep was significantly increased in experimental double transgenic Pachón cavefish (hcrt:GAL4:UAS-BoTxTxBLC-GFP) compared to both control groups, while there was no effect in surface fish (Figure 5E). Waking velocity in surface fish and cavefish was not changed between both control groups and fish expressing hcrt:GAL4; UAS-BoTxBLC-GFP, suggesting that the increased quiescence from neuronal silencing is not due to lethargy (Figure 5F). Silencing subsets of HCRT neurons increased sleep in Pachón cavefish by increasing bout number (Figure 5A–S) without affecting bout duration (Figure 5B–S). Quantification of labeled cells revealed 10.2% of hcrt:GAL4; UAS-BoTxTxBLC-GFP cavefish express GFP in an average of 7.5 cells per expressing animal. Similarly, 11.5% of hcrt:GAL4; UAS-BoTxTxBLC-GFP surface fish express GFP with an average of 6.7 cells per expressing animal. Regression analysis of the number of neurons silenced significantly correlated with total sleep duration (R2 = 0.229) in Pachón cavefish, fortifying the notion that increased HCRT signaling is associated with sleep loss (Figure 5G). A weak correlation between BoTX-expressing HCRT neurons and sleep duration (R2 = 0.091) was also observed in surface fish Figure 5G, consistent with the notion that HCRT may also regulates sleep in surface fish, but cavefish are more sensitive to subtle changes of HCRT signaling. Hypocretin neurons are modulated by sensory stimuli and feeding state, indicating that they are involved in the integration of environmental cues with sleep regulation (Appelbaum et al., 2007; Mileykovskiy et al., 2005). The number of mechanosensory neuromasts that comprise the lateral line, a neuromodulatory system used to detect prey and water flow, are increased in cavefish. This evolved trait is hypothesized to allow for an enhanced ability to forage, object detection, and social behaviors in the absence of eyes (Kowalko et al., 2013; Kulpa et al., 2015; Yoshizawa et al., 2010). 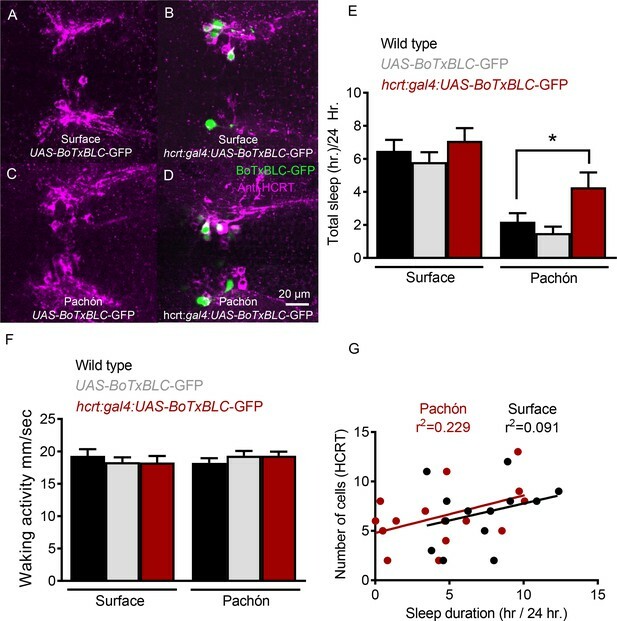 We previously reported that ablation of the lateral line restores sleep to Pachón cavefish without affecting sleep in surface fish, raising the possibility that lateral line input modulates HCRT signaling in cavefish to suppress sleep (Jaggard et al., 2017). To investigate the effects of lateral line input on HCRT, we pre-treated adult fish in the ototoxic antibiotic gentamicin, which effectively ablates the lateral line (Van Trump et al., 2010), and assayed sleep in adult cave and surface fish. In agreement with previous findings, gentamicin treatment fully ablated the lateral line (Figure 6A–D) and restored sleep in cavefish without affecting sleep in surface fish (Jaggard et al., 2017). To determine the effect of lateral line ablation on HCRT regulation, we quantified hcrt expression or neuropeptide levels in adult cave and surface fish following gentamicin treatment. Quantitative PCR analysis of gentamicin treatment revealed that hcrt expression was significantly reduced in cavefish to levels equivalent to untreated surface fish (Figure 6E). By contrast, there were no significant changes in hcrt expression following gentamicin treatment in surface fish. Therefore, the robust effect of lateral line ablation in cavefish indicates that the lateral line selectively enhances HCRT levels in cavefish. Comparison and detailed quantification of HCRT neuropeptide levels in the hypothalamus reveals that lateral line ablation does not impact the number of HCRT-positive hypothalamic neurons, but instead selectively reduces the level of HCRT within each cell in cavefish (Figure 6F–K), supporting the notion that the lateral line is required for enhancement of HCRT function in cavefish. Together, these findings reveal that sensory input from the lateral line promotes sleep and hcrt expression in Pachón cavefish, providing a link between sensory input and transcriptional regulation of a wake-promoting factor. In addition to its potent role in sleep regulation, hcrt promotes food consumption in fish and mammals (Penney and Volkoff, 2014; Tsujino and Sakurai, 2013; Yokobori et al., 2011). We previously reported that prolonged starvation increases sleep in cavefish without affecting sleep in surface fish (Jaggard et al., 2017), but the role of HCRT in feeding-state dependent modulation of sleep-wake cycles has not been investigated. Quantitative PCR analysis from whole-brain extracts revealed that hcrt transcript is significantly reduced in cavefish following 30 days of starvation; however, the same treatment does not affect hcrt transcription in surface fish, indicating that cavefish are more sensitive to starvation-dependent changes in HCRT (Figure 7A). To determine whether HCRT neuropeptide is produced in a greater number of cells during starvation, we quantified HCRT-positive neurons in fed and starved state (Figure 7B–G). Similar to lateral line ablation, starvation reduced HCRT levels in each cell, without affecting the number of HCRT-positive neurons. Further, starvation did not affect the number of HCRT-positive cells or HCRT levels per cell in surface fish (Figure 7B). These results indicate that the starvation modulates HCRT levels, rather than the number of cells that produce HCRT. The acute regulation of HCRT by feeding state and lateral line dependent sensory input demonstrates a unique link between these neuronal systems and those mediating sleep/wake cycles. Cavefish are a unique model for investigating neural and genetic regulation of sleep, particularly from an evolutionary perspective. Robust phenotypic differences have been observed in multiple populations of cavefish, but our findings provide the first evidence of altered regulation of a neuromodulatory peptide that associates with the evolution of sleep loss. Alignment of hcrt sequences derived from surface and Pachón cavefish indicate that there are no differences in the genomic sequences within coding regions of the two morphs. Our findings do, however, reveal dramatic differences in hcrt expression and neuron number between surface fish and cavefish, raising the possibility that regulation and development of hcrt is altered evolutionarily. These observations are in agreement with concurrent findings that increased levels of the homeobox transcription factor Lhx9 specifies greater number of HCRT-neurons in cavefish (Alie et al., 2018). Further, the acute differences in hcrt expression between surface fish and cavefish likely occur at the level of changes in genomic enhancers or neuronal connectivity, which affect HCRT functioning. Because our findings also reveal an increased number of HCRT-positive neurons in early development, it is also likely that developmental differences between the brains of surface and cavefish underlie differences in HCRT function. Examination of cell body number in 6 dpf fry reveals increased HCRT-positive neurons in cavefish, indicating HCRT differences are present during early development. In agreement with these findings, broad anatomical differences in forebrain structure have previously been documented between surface fish and cavefish including an expanded hypothalamus (Menuet et al., 2007). A concurrent paper revealed that neurons expressing Neuropeptide Y are also increased in cavefish (Alie et al., 2018). Like Hcrt, Neuropeptide Y also regulates feeding and sleep in diverse species, suggesting changes in hypothalamic regulation of sleep are, at least partially, developmentally-derived and not limited to the changes in Hcrt function that we have observed (Chung et al., 2017; Luquet et al., 2005; Szentirmai and Krueger, 2006; Wu et al., 2003). Therefore, it is likely that developmentally-derived differences in the number of HCRT-positive neurons and modified hypothalamic neural circuitry contribute to sleep loss in cavefish. Multiple lines of evidence presented here support a robust role for evolved differences in HCRT function in the evolution of sleep loss in Pachón cavefish. Pharmacological inhibition of HCRT signaling with three different HCRTR2 antagonists restored sleep in cavefish, suggesting that HCRTsignaling is required for at least some of the sleep loss in cavefish. The antagonists used have not been validated in zebrafish or A. mexicanus, and therefore it is possible that non-specific effects contribute to the sleep phenotype. Future work characterizing these pharmacological inhibitors in A. mexicanus, will be useful for validating the phenotypes observed in this manuscript. Complementing pharmacological experiments, targeted knockdown of hcrt using morpholinos, or genetic silencing of HCRT neurons promote sleep in Pachón cavefish without significantly affecting sleep in surface fish. While manipulations that inhibit HCRT signaling have potent affects on cavefish sleep, it does not rule out a possible role for HCRT modulation of sleep in surface fish. All three manipulations employed are likely to only partially disrupt HCRTR signaling, and it is likely that complete inhibition of HCRTR signaling would increase sleep in surface fish. Indeed, Hypocretin is highly conserved and has been shown to consolidate wakefulness in species including in animals ranging from zebrafish to humans (Appelbaum et al., 2009; Chemelli et al., 1999; Mileykovskiy et al., 2005; Prober et al., 2006). Moreover, the Hypocretin system has been characterized in detail in zebrafish and acts as a key mediator of arousal (Appelbaum et al., 2009; Elbaz et al., 2012; Kaslin et al., 2004; Prober et al., 2006). The findings presented here extend studies in mammalian and zebrafish models, and suggest that regulation of HCRT signaling may be subject to evolutionary pressure, and implicate it as a potential ‘hot-spot’ for variation in sleep throughout the animal kingdom. While the neural processes regulating HCRT activity are not fully understood, growing evidence suggests these neurons integrate sleep-wake regulation with responses to sensory stimuli (Appelbaum et al., 2007; Mileykovskiy et al., 2005; Woods et al., 2014). In mice, HCRT neurons are transiently activated by sound, feeding, and cage exploration, suggesting that HCRT neurons are generally regulated by external stimuli (Mileykovskiy et al., 2005). Further in zebrafish, HCRT neurons activation is associated with periods of wakefulness and overexpression of HCRT enhances locomotor response to diverse sensory stimuli, while ablation of HCRT neurons reduces response to sound stimulus (Elbaz et al., 2012; Naumann et al., 2010; Prober et al., 2006; Woods et al., 2014), suggesting that HCRT neurons mediate sensory responsiveness and sleep-wake behavior. Our findings reveal that ablation of the lateral line in cavefish reduces hcrt transcript and HCRT neuropeptide abundance to levels indistinguishable from their surface fish conspecifics, indicating that lateral line input is a potent regulator of hcrt production in cavefish. These findings support the notion that evolution of sensory systems dramatically affect central brain processes that regulate behavior, and provide further support that HCRT neurons integrate sensory stimuli to modulate sleep and arousal. While a full understanding of the neural circuitry regulating HCRT-positive neurons has not been determined, HCRT neurons send projections to numerous areas implicated in behavioral regulation including the periventricular hypothalamus, the raphe, and thalamic nuclei (Panula, 2010). 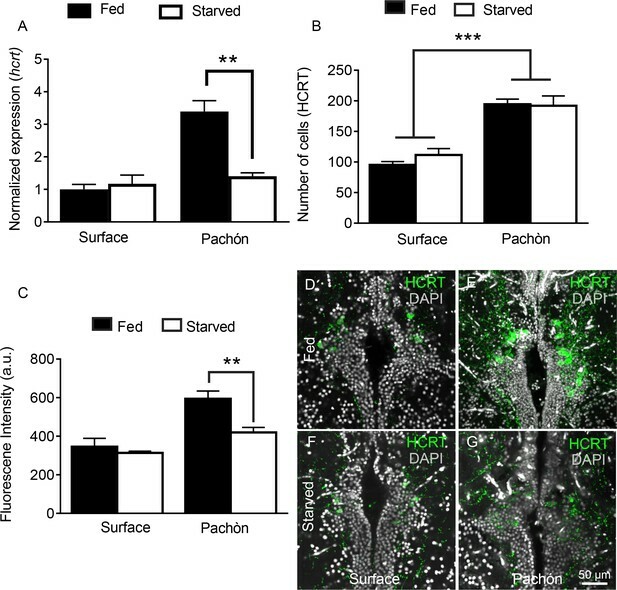 Evidence suggests that the wake-consolidating role of HCRT neurons is dependent on norepinephrine signaling, and optogenetic activation of HCRT neurons activates the locus coeruleus (Singh et al., 2015), raising the possibility that activation of this arousal pathway is enhanced in Pachón cavefish. Norepinephrine levels are elevated in the brains of cavefish and treatment of cavefish with the β-adrenergic inhibitor propranolol restores sleep in cavefish without affecting sleep in surface fish. (Bilandžija et al., 2013; Duboué et al., 2012). Therefore, it is possible that differences in norepinephrine signaling contribute to hcrt-dependent sleep loss in cavefish. Further investigation of the synergistic effects of norepinephrine and hcrt, and the effects of their pre-supposed interaction on feeding- and sensory-mediated hcrt regulation, will be critical in our understanding of how sleep changes can be driven by alterations in the environment. The finding that ablation of the lateral line or starvation suppress hcrt transcript reveals a role for plasticity of HCRT signaling in response to environmental perturbation. In addition to its role in sleep-wake regulation, hcrt neurons regulate feeding and metabolic function, raising the possibility that HCRT neurons are integrators of sleep and metabolic state. Previous findings reveal that injection of HCRT peptide increases food consumption in cavefish, suggesting the consummatory behavior induced by HCRT in mammals is conserved in A. mexicanus (Penney and Volkoff, 2014; Wall and Volkoff, 2013). Studies in mammals and zebrafish suggest HCRT neurons are regulated by the adipose peptide hormone, Leptin (Leinninger et al., 2011; Levitas-Djerbi et al., 2015). Adipose levels in cavefish are elevated compared to surface fish (Aspiras et al., 2015), and it is possible that prolonged starvation reduces Leptin levels, thereby inhibiting hcrt expression to promote sleep in cavefish. Further, the lateral line system is intimately linked to feeding behavior in fish, and evolved differences in the lateral line system have been identified between surface fish and cavefish (Yoshizawa et al., 2012), perhaps including increased modulation of hcrt neurons. These findings raise the possibility of using cavefish as a model for examining the Leptin-HCRT axis and, more generally, interactions between sleep, sensory processing and metabolic function. Our findings specifically examine neural mechanisms underlying sleep loss in the Pachón cave populations. Both morphological and genomic data suggest Pachón cavefish are one of the oldest, and most troglomorphic of the 29 A. mexicanus cavefish populations (Bradic et al., 2012; Dowling et al., 2002; Ornelas-García et al., 2008; Strecker et al., 2003). We have also demonstrated evolutionary convergence on sleep loss in other populations of cavefish, including Molino, Tinaja and Chica cave populations (Jaggard et al., 2017). However, ablation of the lateral line has no effect on sleep in Molino, Tinaja and Chica populations, suggesting distinct neural mechanism underlie sleep loss between Pachón cavefish, and other cavefish populations assayed (Jaggard et al., 2017). Future studies will reveal if enhanced HCRT function represents a conserved mechanism for sleep loss, or that sleep loss in other fish populations is HCRT independent. Taken together, these studies raise the possibility that evolved differences in HCRT function contribute to the evolution of sleep loss in cavefish. Sleep is highly pleiotropic and it is likely that many additional genetic factors contribute to sleep differences between sleep in cavefish. Zebrafish provide a comparable genetic model that has implicated many novel genes and modulators in sleep regulation including Histamine, Corticoptropin Releasing Hormone and melatonin (Appelbaum et al., 2009; Chiu et al., 2016; Kaslin et al., 2004; Zhdanova et al., 2001). Future work examining functional differences in these genes may provide a mechanism for identifying additional genes involved in the evolution of sleep. In addition, the interfertility between surface and cave populations of A. mexicanus allows for QTL mapping and the potential to identify novel genetic regulators of sleep (Gross, 2012; Jeffery, 2009). The identification of evolved differences in HCRT that likely regulate sleep provide a starting point for elucidating the genetic underpinnings associated with the evolution of complex behaviors. Animal husbandry was carried out as previously described (Borowsky, 2008b) and all protocols were approved by the IACUC Florida Atlantic University (Protocols A15-32 and A16-04). Fish were housed in the Florida Atlantic University core facilities at 23 ± 1°C constant water temperature throughout rearing for behavior experiments (Borowsky, 2008b). Lights were kept on a 14:10 hr light-dark cycle that remained constant throughout the animal’s lifetime. Light intensity was kept between 25–40 Lux for both rearing and behavior experiments. All fish used for experiments were raised to adulthood and housed in standard 18–37L tanks. Adult fish were fed a mixture diet of black worms to satiation twice daily at zeitgeber time (ZT) 2 and ZT12, (Aquatic Foods, Fresno, CA,) and standard flake fish food during periods when fish were not being used for behavior experiments or breeding (Tetramine Pro). Adult fish were recorded in standard conditions in 10L tanks with custom-designed partitions that allowed for five fish (2L/fish) to be individually housed in each tank as previously described (Yoshizawa et al., 2015). Recording chambers were illuminated with custom-designed IR LED source (Infrared 850 nm 5050 LED Strip Light, Environmental Lights). After a 4–5 day acclimation period, behavior was recorded for 24 hr beginning ZT0-ZT2. Videos were recorded at 15 frames/sec using a USB webcam (LifeCam Studio 1080 p HD Webcam, Microsoft) fitted with a zoom lens (Zoom 7000, Navitar). An IR high-pass filter (Edmund Optics Worldwide) was placed between the camera and the lens to block visible light. For larval fish recordings, individual fish were placed in 12 well tissue culture plates (BD Biosciences). Recording chambers were lit with a custom-designed IR LED light strip and placed beneath the recording platform. Fish were allowed to acclimate for 24 hr before starting behavioral recordings. Videos were recorded using Virtualdub, a video-capturing software (Version 1.10.4) and were subsequently processed using Ethovision XT 9.0 (Noldus, IT). Water temperature and chemistry were monitored throughout recordings, and maintained at standard conditions in all cases. Ethovision tracking was setup as previously described (Yoshizawa et al., 2015). Data was then processed using Perl scripts (v5.22.0, developed on-site) and Excel macro (Microsoft) (Yoshizawa et al., 2015). These data were used to calculate sleep information by finding bouts of immobility of 60 s and greater, which are highly correlated with increased arousal threshold, one of the hallmarks of sleep (Yoshizawa et al., 2015). For drug treatment studies, fish were allowed normal acclimation periods, followed by 24 hr of baseline recording. At ZT0 fish were treated with either control dimethyl sulfoxide solvent (0.1% DMSO) or freshly prepared TCSOX229 (Tocris), EMPA (Tocris), Suvorexant (Adooq), or YNT-185 (Adooq) (Hoyer et al., 2013; Kummangal et al., 2013; Malherbe et al., 2009; Plaza-Zabala et al., 2012) diluted to a final concentration of 1–30 µM into each recording chamber and behavior was recorded for 24 hr. The hcrt morpholino sequence 5’-TGGGCTTGGTGTGATCACCTGTCAT-3’ was designed (Gene Tools, LLC) based on the available sequence ENSAMXG00000000473 (Ensembl). The hcrt-MO targets the first 25 bp of the hcrt open reading frame (ORF) to block translation via steric hinderance. Control injections were performed using a standard scrambled sequence 5’CCTCTTACCTCAGTTACAATTTATA-3’ (Gene Tools, LLC). Embryos were injected at the 1–2 cell with a 1 nl volume using a pulled borosilicate capillary with a PLI-A100 picoinjector (Warner Instruments) for a final concentration of 0.2 mM morpholino, in accordance with previously published methods (Bilandžija et al., 2013; Gross et al., 2009). Survival of all embryos was monitored every 6 hr for the first 96 hr of development until behavior was recorded over the next 24 hr. hcrt-Gal4:UAS-BoTx-BLC-GFP injections were carried out as follows: Plasmid DNA for the Gal4 and the UAS were coinjected into 1–4 cell stage embryos using a pulled borosilicate capillary with PLI-A100 picoinjector (Warner Instruments) at concentration of 25 ng/µL. Tol2 mRNA was coinjected in the cocktail at a concentration of 25 ng/µL. UAS-BoTx-BLC-GFP was injected alone at 25 ng/µL to serve as an injected control group for both Surface and Pachón cavefish. All injected fish were raised to 25 dpf in standard conditions, when behavioral recordings were carried out. 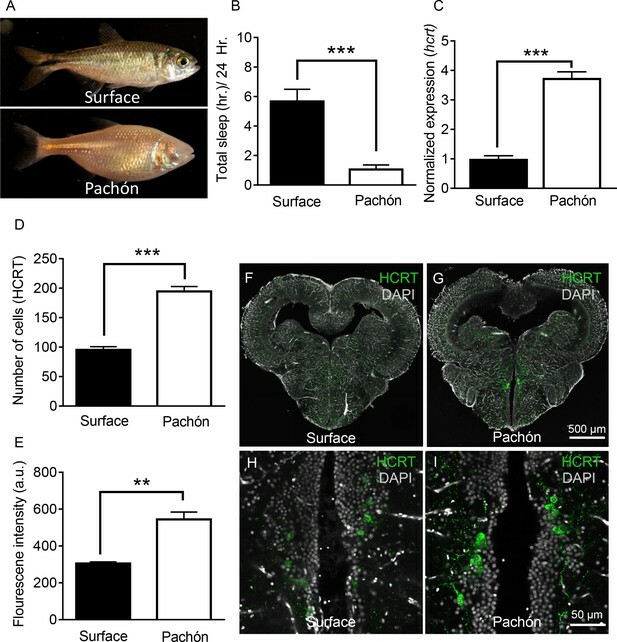 Brains from all fish recorded for behavior were dissected and processed for immunohistochemistry in order to quantify by GFP the number of cells silenced by expressing hcrt-Gal4:UAS-BoTx-BLC-GFP. Fish were treated with 0.002% gentamicin sulfate as previously described (Sigma Aldrich, Carlsbad, CA 1405-41-0) (Van Trump et al., 2010). Following baseline sleep recording and neuromast imaging, fish were bathed in gentamicin for 24 hr. Following the treatment, a complete water change was administered and behavior was again recorded for 24 hr. Fish treated with gentamicin were housed in separate tanks for at least 1 month after treatment in order to avoid contamination. Lateral line re-growth was measured with DASPEI staining two weeks following ablation to confirm that there were no long-term effects from the ablation treatments. To compare Hypocretin/Orexin (HCRT), we aligned the accessioned protein sequences of A. mexicanus surface fish (SRR639083.116136.2, SRA) and Pachón cavefish (ENSAMXP00000000478) to orthologous HCRT in zebrafish (ENSDARP00000095322), Medaka (ENSORLP00000004866), Tetraodon (ENSTNIP00000014660), mouse (ENSMUSP00000057578) and human (ENSP00000293330). Protein alignment, neighbor joining tree (cladogram) and sequences analyses were performed with Clustal Omega (v.1.2.1, EMBL-EBI, [Sievers et al., 2011]). HCRT domains (PF02072/IPR001704) were determined using Ensembl genome browser (v.83, EMBL-EBI/Sanger) and PFam/Interpro (v.28.0, EMBL-EBI). To measure levels of hcrt mRNA, whole brains of one-two year old fish were extracted immediately after behavior was recorded (ZT2). After extraction, individual brains were frozen and homogenized in trizol (QIAGEN, Valencia,CA). RNA was extracted with an RNeasy Mini Kit (QIAGEN, Valencia,CA). All RNA samples were standardized to 10 ng/µL concentrations and cDNA synthesis was carried out using iScript (BioRad, Redmond, WA). RT-qPCR was carried out using SsoAdvanced Universal SYBR Green Supermix (BioRad, Redmond, WA) with DNase to eliminate genomic contamination (QIAGEN, Valencia, CA). PCR primers were used at an annealing temperature of 53.3°C; their sequences follow: hcrt forward 5’-CAT-CTC-CTC-AGC-CAA-GGT-TT-3’, hcrt reverse 5’-TAG-AGT-CCG-TGC-TGT-TAC-ACC-3’. Gapdh was used as the control gene, and was amplified with the following primer set: forward 5’-TGT-GTC-CGT-GGT-GGA-TCT-TA −3’, reverse 5’-TGT-CGC-CAA-TGA-AGT-CAG-AG-3’. Primers were designed to span an exon boundary to eliminate potential for genomic contamination and a melting curve analysis was performed post amplification to confirm a single amplicon for each target gene. The following qPCR protocol was run on a Bio Rad CFX96 with a C1000 thermal cycler: 95.0°C for 3 min followed by a plate read at 95.0°C for 10 s to 53.3°C for 30 s followed by a plate read repeated 39 times. qPCR efficiency was calculated to be 100% as reported by CFX Manager software 3.1, and melt curve analysis showed a single peak for each gene used in this study. All samples were compiled into Bio Rad CFX manager gene study (version 3.1) to account for inter-run calibration. All samples were normalized to one (relative to surface fish controls). Following euthanasia in MS-222 (Sigma Aldrich, Carlsbad, CA) and ice-water, brains were immediately dissected from adults in ice-cold PBS and fixed overnight in 4% Paraformaldehyde/1x PBS (PFA). Adult brains were then placed in 20% sucrose for cryoprotection overnight or until the brains sunk to the bottom of the well (Kaslin et al., 2004). Whole brains were then flash frozen and mounted in OCT compound (23-730-571 Fisher scientific) for sectioning. Whole brains were serial sectioned in 50 µm slices, all slices were floated in PBS to rinse out embedding solution. Slice sections were then washed in 0.5% Triton-X 100/PBS (PBT) for 3 × 15 min and co-incubated in 0.5% PBT and 2% Bovine serum albumin (BSA) (Sigma) with primary antibody anti-ORX-A 1:2000 (RRID:AB_2117647 EMD Millipore) overnight at 4°C in. The slices were rinsed again in 0.5% PBT, 3X for 15 min and placed in secondary antibody 1:600 (Goat anti-rabbit 488; Life Technologies) for 90 min at room temperature. Slices were mounted on slides in Vectashield with DAPI (VectorLabs) and imaged on a Nikon A1 confocal microscope. Whole-mount larvae were fixed overnight in 4% PFA, rinsed 3 × 15 min in 0.5% PBT, then placed in 0.5% PBT with 2% BSA and primary antibody anti-ORX-A 1:2000 overnight. Following 3 × 15 min 0.5% PBT rinse, larvae were placed in secondary antibody 1:600. Larvae were then placed in Vectashield with DAPI until mounted in 2% low melt temp agarose (Sigma Aldrich, Carlsbad, CA) for imaging. All samples were imaged in 2 μm sections and are presented as the Z-stack projection through the entire brain. For quantification of HCRT levels, all hypothalamic slices were imaged in 2 μm sections, merged into a single Z-stack as maximum fluorescence, and the total brain fluorescence was determined by creating individual ROIs for each cell expressing HCRT. Two-way ANOVA tests were carried out to test the effects of pharmacological and starvation paradigms among different groups and populations on behavior. Each was modeled as a function of genotype (Surface and Pachón) and genotype by treatment interaction (TCS, gentamicin, or starvation, respectively). Significance for all tests was set at p<0.05. When the ANOVA test detected significance, the Holm-Sidak multiple comparison post-test was carried out to correct for the number of comparisons. For comparison of two baseline groups, non-parametric t-tests were carried out to test for significance. Each experiment was repeated independently at least three times. All replicates were biological replicates run independently from one another. No data was excluded, and no statistical outliers were removed. All statistical analysis were carried out using SPSS (IBM, 22.0) or InStat software (GraphPad 6.0). Power analyses were performed to ensure that we had sufficient N to detect significant differences at a minimum of 80% power at the 0.05 threshold using Graphpad InStat. Development, Growth & Differentiation 50:391–399. Journal of Medicinal Chemistry 56:7590–7607. Cold Spring Harbor Protocols 2008:pdb.prot5093. Cellular and Molecular Life Sciences 65:2296–2306. Molecular Biology and Evolution 19:446–455. Brain, Behavior and Evolution 80:233–243. Journal of Biological Chemistry 281:29753–29761. The Journal of Experimental Biology 220:284–293. Journal of Experimental Biology 218:1603–1612. Journal of Comparative Neurology 523:831–848. British Journal of Pharmacology 156:1326–1341. Experimental & Molecular Medicine 47:e148. Journal of Medicinal Chemistry 58:7931–7937. 381–386, Hypocretin/orexin in fish physiology with emphasis on zebrafish, Acta Physiologica. General and Comparative Endocrinology 196:34–40. American Journal of Physiology-Regulatory, Integrative and Comparative Physiology 291:R473–R480. General and Comparative Endocrinology 183:44–52. General and Comparative Endocrinology 171:124–130. Thank you for submitting your work entitled "Hypocretin underlies the evolution of sleep loss in the Mexican cavefish" for consideration by eLife. Your article has been reviewed by three peer reviewers, and the evaluation has been overseen by a Senior Editor. Our decision has been reached after extensive consultation between the reviewers. Based on these discussions and the individual reviews below, we regret to inform you that your work will not be considered further for publication in eLife in its present form. While all three reviewers found the work to potentially of great interest, they also raised significant concerns. In particular, the reviewers would like to see addition of loss of function experiments to confirm the role of hypocretin. We would be open in the future to a new submission that addresses the concerns of the reviewers, such that every effort would be made to return the paper to the original reviewers. We hope you find the comments of the reviewers, appended below, helpful in revising the manuscript. The manuscript "Hypocretin underlies the evolution of sleep loss in the Mexican cavefish" by Jaggard et al. addresses the neurological basis of sleep loss in cavefish. The authors found that the number of hypocretin neurons is increased in cavefish correlating with the previously observed sleep loss in cavefish populations. The authors use pharmacological treatments to dissect the neurological basis of the sleep phenotype in cave and surface fish. In addition, the authors link the changes in hypocretin activity to physiological phenotypes in the cavefish suggesting not only a plastic behavioral response but also plasticity in the underlying neuronal workings of hypocretin. The study is interesting and carefully executed. I fully support publication in eLife. I have only two comments, one technical, one conceptual. I have some slight concerns with the quantitative PCR data. For example, I was not able to find the primer sequences for rpl13α in the publicly available genome information. In the case for gapdh the primers are designed poorly as they span only a very small intron and would give a similarly sized product from genomic DNA which is a common contamination in cDNA preparations no matter how careful the cDNA is prepared. Given that the qPCR data is crucial for the message of the manuscript, I would like to see some better designed controls. While the plasticity part is quite exciting, I have some trouble to fully comprehend its implications. I can see that starvation is triggering a reduction in wakefulness, presumably through hypocretin. I am not sure, however, how novel or important this is for this study and how this compares to other systems? Also, how can the authors distinguish between causality and it being simply a readout of sleep need? Same is true for the lateral line part, what is the mechanistic basis of the reduction in lateral line signaling leading to a reduction in hypocretin signaling and how does this correlate with the presumably developmental differences that the authors mention in the Discussion (first paragraph)? I feel the manuscript would profit from an extended explanation of this part. This is a very important manuscript that provides a new link between the wakefulness promoting neuropeptide hypocretin and previously discovered differences in sleep behavior in surface- and cave-dwelling Astyanax mexicanus. The major finding is that upregulation of hypocretin at both the transcript and protein levels is correlated with increased wakefulness in cavefish. Pharmacological data support a direct relationship between the neuropeptide function and the cavefish behavior. Because hypocretin neurons are found in the hypothalamus this discovery provides a possible explanation for why this part of the brain is modified during the evolution of cavefish. The novel information within this manuscript will markedly improve our general understanding of the conserved role of hypocretin in the evolution of sleep regulation. The following comments are offered to improve the manuscript. The results show that knocking down hypocretin with a pharmacological inhibitor increases sleep duration in cavefish. However, there is no effect on surface fish. Could an effect on surface fish be achieved by knocking up hypocretin, possibly by injecting transcripts, an expression construct containing the gene, or the protein? To extend the above comment, there is no explanation given as to why pharmacological inhibition of hypocretin does not affect surface fish if this neuropeptide is indeed a general regulator of sleep behavior. Although controls for the quantitative PCR analyses are mentioned in the Materials and methods, I cannot find a place where the control data is illustrated in the manuscript. Ideally, the control data for quantitative PCR should be presented for evaluation alongside the experimental results. I understand that this may be a part of the "normalization" process, but it is stated that normalization was relative to surface fish controls (subsection “Quantitative PCR (qPCR)”). Perhaps the "control" genes themselves change between surface fish and cavefish. More information is needed about this possibility. Why are the critical results for gentamycin treatment printed so lightly in Figures 3B, D, such that even the orbits are difficult to distinguish? Are there no neuromasts at all that survive the treatment? More contrast needs to be included in the photographs for the reader to be convinced about the effects of the treatment on the levels of DASPEI stained neuromasts. This is particularly true for cavefish, in which superficial neuromasts in the head are more numerous than in surface fish. The quantitative results shown in Figure 3F do not seem to correspond well to the representative photographs in Figure 3I, K. It seems like there are more hypocretin stained cells in Figure 3I than in K, not only a decrease in the level of staining in each cell, and this is not evident in the quantification in Figure 3F. The same is true for Figures 4B, E, and G. Perhaps the images need to be enlarged. To continue with the comment immediately above, it appears that there are variable levels of hypocretin staining in cell clusters in different parts of the section. Is this real, and if so, does it correspond to particular centers within the hypothalamus? In the Discussion, it states that there are "no differences in the (sic hypocretin) genomic sequence" between the two morphs. A correction is needed because only exon sequences could have been determined from the transcriptome data of Gross et al. (2013). In the fourth paragraph of the Discussion, the authors point out that the wake-promoting role of HCRT neurons is dependent on norepinephrine signaling. However, they fail to point out that norepinephrine has been demonstrated to be increased in cavefish (see Bilandzija et al., 2013, PloS ONE 8 (11): e80823). This information is important here. It should be added and the Discussion revised accordingly. Jaggard et al. examines hypocretin neurons in two different populations of the Mexican cavefish, Astyanax mexicanus. They identified difference in hypocretin neuron cell numbers in the surface-dwelling vs cave-dwelling populations. Pharmacological inhibition of HCRT signaling increases sleep duration in cavefish. Further they perform manipulations that promote sleep, such as lateral line ablation and starvation, and show that hcrt expression is inhibited in cavefish and not in surface fish. Based on these results the authors conclude that alteration in HCRT signaling contribute to the evolution of sleep loss. Given the conserved role of HCRT in sleep regulation in different species, the conclusion of this study seems logical and expected. However, their experimental results are insufficient to support this conclusion. The difference in hypocretin neuron cells numbers between these two species are clear, yet beyond this correlation the evidence that the study provides attempting to causally link HCRT and sleep loss is weak. 1) The authors draw their conclusion based on three experimental manipulations- pharmacological manipulation of Hcrt receptor 2, lateral line ablation using gentamicin, and starvation. The only "specific" manipulation for Hcrt system is the pharmacological manipulation using TCSOX229 (TCS). The authors cite Plaza-Zabala et al. 2012, which shows the application of this HCRTR2 in mice. A big issue in this study is that there is no control to show that the application actually affects hypocretin neurons in zebrafish. What is the half-life of TCS in water? How do we know that TCS is selective for HCRTR2 in zebrafish? The protein sequences of HCRTR2 in zebrafish and mouse are different and what is the evidence that TCS is a specific HCRTR2 antagonist in zebrafish? Even if this has been shown elsewhere, the authors need to demonstrate that it works in their lab in the context of this study as well. For example, the authors could show altered activity of cells expressing HCRTR upon TCS treatment using c-fos, p-ERK staining, etc. Also how is the dosage determined? What is the evidence that TCS actually penetrates and reaches the hypothalamic hypocretin neurons when supplied in bath water at this concentration? In mice TCS is administered by IP route in a volume of 5 mL/kg body weight. 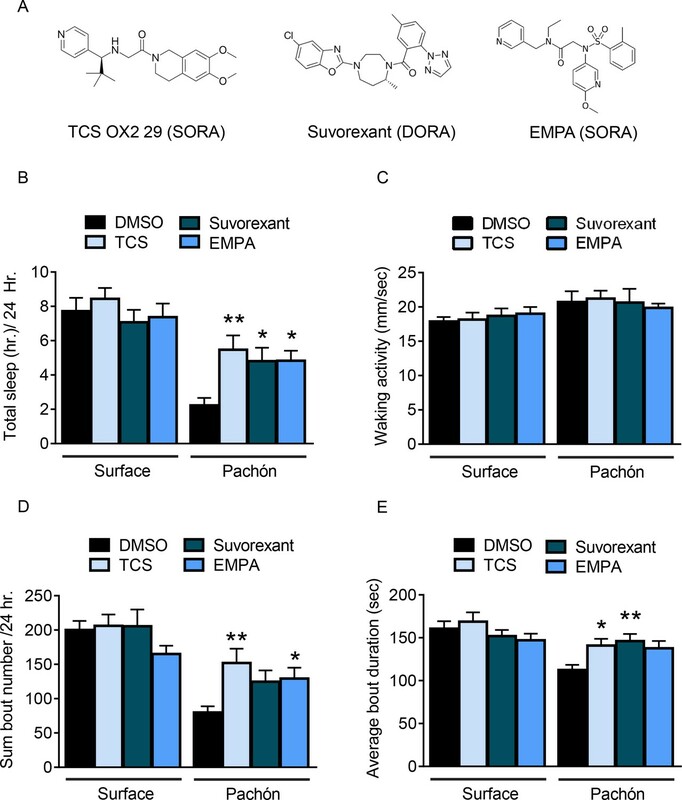 In this study the TCS doses were based on a pilot experiment testing the effects of this antagonist on the hyperactivity induced by hypocrein-2 in C57BL/6J mice. A similar experiment using hypocretin overexpression or knock out could be done to determine the effective concentration. 2) Pharmacological manipulations can have pleiotropic effects depending on the dosage even if the authors show that it targets HCRTR2. The possibility that it can target other proteins in addition to HCRT will be difficult to rule out. Therefore the authors need to show independent lines of evidence that HCRT is involved in sleep loss using genetic manipulation using morpholinos against HCRT/HCRTR and overexpressing HCRT/HCRTR, which should show the opposite phenotype from morpholino treatment. 3) Presumably many other cell types other than HCRT could show differences between surface and cave-dwelling types apart from HCRT. Modulation of several neuropeptide/neurotransmitter systems could affect sleep dramatically. For example, differences in CRH (corticotropin-releasing- hormone) or histaminergic, or NPY system could alter sleep. The authors should examine differences in other major neuropeptide systems that are involved in sleep regulation between surface and cave fish. 4) I am confused about the some of the supplementary figure information. For example, what is the difference between Figure 2A, B vs. Figure 2—figure supplement 1A and B. Are they both treated with TCS as the figures themselves indicate? Congratulations, we are pleased to inform you that your article, "Hypocretin underlies the evolution of sleep loss in the Mexican cavefish", has been accepted for publication in eLife. The authors investigate the role of a hypocretin in controlling sleep in the blind Mexican cavefish. The results suggest that evolutionary changes in hypocretin regulation may have been a driving factor in the evolution of sleep loss. On further discussion the reviewers agreed that the morpholino controls recommended by reviewer #2 (below) are not essential for the publication of this work. In the revised manuscript "Hypocretin underlies the evolution of sleep loss in the Mexican cavefish" by Jaggard et al. the authors have addressed all my previous comments. The manuscript is now substantially improved and provides several novel technical advances in the cavefish field. The use of Gal4 UAS in mosaic transgenics is elegant and very convincing. The morpholino results by its own would technically require some additional controls (e.g. RT-PCR of splice morpholino or RNA rescue), however, as they only serve as additional evidence, their use strengthen the other results significantly, especially as the authors have established their behavioral assays now in larval fish which will be useful for future studies. There are still some oversight mistakes but I assume these can be taken care through editorial revision (e.g. Results, fifth, sixth, seventh and ninth paragraphs; Discussion second and third paragraphs). This manuscript is the resubmission of a previous manuscript submitted to eLife, that was not accepted for publication. The major criticism was that not enough evidence, above pharmacological studies, was included to strongly support the possibility that hypocretin is evolved in cavefish sleep loss, and that it was unlikely that the required information could be produced within the time frame required by the journal. The present manuscript answers some (but not all) of the previous objections, and is considerably improved over the previous submission. An improvement is the development of a morpholino-based procedure for knockdown of the hypocretin gene, which resulted in an increase in sleep duration in cavefish, without affecting sleep in surface fish, as predicted by the authors’ hypothesis. Morpholinos have been in use for some time in cavefish, most recently by Bilandzija (2013) for oca2 knockdown. In the latter study, it was simple to determine the morpholino effects because visible pigmentation was reduced or eliminated. In other morpholino studies, however, controls in addition to scrambled morpholinos were done to be certain the that morpholinos were working on the expected targets. Such controls are not reported here, and would be seem to be necessary for publication in eLife. A translation blocking morpholino is used in these experiments, so the appropriate control would be to compare hypocretin protein levels using the available antibody, either in Western blots (preferred for more exact quantification) or in immuno-imaging experiments of the brain. These controls could be done rather quickly. In this manuscript, Jaggard et al. investigate HCRT and its role in controlling sleep in Astyanix mexicanus, the blind Mexican cavefish. Through pharmacological and genetic manipulations, the authors show that an increase in HCRT is associated with sleep loss in the Pachón cavefish. Comparing the results of the cave population to the surface population, along with previous zebrafish and mouse data, the authors conclude that evolutionary changes in HCRT function and regulation may have been a driving factor in the evolution of sleep loss in the Pachón cavefish. This is a very interesting paper. The authors addressed all of the reviewer's concerns and the data presented will, no doubt, further understanding of HCRT and its evolutionary role in sleep regulation as well as provide fuel for further experiments addressing the evolution of sleep. The data presented is very thorough and the authors' interpretation of the role of HCRT in sleep regulation of the Pachón cavefish population is very convincing. […] I have some slight concerns with the quantitative PCR data. For example, I was not able to find the primer sequences for rpl13α in the publicly available genome information. In the case for gapdh the primers are designed poorly as they span only a very small intron and would give a similarly sized product from genomic DNA which is a common contamination in cDNA preparations no matter how careful the cDNA is prepared. Given that the qPCR data is crucial for the message of the manuscript, I would like to see some better designed controls. We originally chose to standardize qPCR experiments against rpl13a and gapdh because these had been used in resent A. mexicanus papers (Beale et al., 2013, Stahl and Gross, 2015). In the original submission there was a typo in the reported primer sequences for gapdh, which has been corrected in the revised manuscript. These specific primers have been used repeatedly with success in multiple publications (Gross and Wilkens 2013, Stahl and Gross 2015, and Gross et al. 2016). However as requested, we re-analyzed and validate that these primers are appropriately designed for our purposes. These gapdh primers amplify a cDNA product of 152bp, which spans two exons. In the scenario that contaminated gDNA were to be amplified, this would yield a 300bp amplicon. To confirm amplification of our specific cDNA product, we performed a melt curve analysis post qPCR amplification, which has been widely used to detect small differences in amplicon size for genotyping (Herrmann et al. 2006) and can easily resolve out peaks for products differing 150bp in length (Ririe KM, Rasmussen, P et al. 1997). Consistent with standard qPCR guidelines (Taylor S, Wakem M, et al. 2010), our melt curve analysis yielded a single peak for gapdh, therefore we determined these primers are consistent and sufficient for our analyses. Further, we have reported the values of housekeeping genes in (Figure 1—figure supplement 1) and report the M-values for housekeeping efficiency, along with additional details described above to the Materials and methods section. At the reviewer’s suggestion we have reanalyzed the targets of the previously published rpl13a primers (Beale et al. 2013). These were originally selected based on being ‘remarkably consistent between all A. mexicanus populations (Beale et al., 2013). However, publication of the cavefish genome (McGaugh et al. 2014) and recent re-sequencing releases available on NCBI do not reveal targets for these, and they instead match perfectly to the Danio genome. We believe this is most likely due to sequencing errors in the A. mexicanus genome. However, out of an abundance of caution, we have omitted rpl13a from the revised manuscript. All qPCR data in the resubmission standardize against gadph alone. The current version describes work in fish and mice indicating that Hcrt is regulated by sensory stimuli and by leptin regulation. We propose that Hcrt is critical for sleep plasticity in response to environmental perturbations. With respect to causality, this is difficult to directly address, though it is widely believed that Hcrt is not an output of sleep regulation. With respect to causality, we hope that experiments inhibiting Hcrt function (pharmacological, genetic silencing, and morpholino) now support the notion that inhibiting Hcrt function in cavefish promotes sleep. The reviewer also noted a number of typos/grammatical errors. We thank the reviewer for noticing these minor errors and hope to have fixed these in the revised manuscript. […] The following comments are offered to improve the manuscript. The current version includes numerous additional experiments to support initial pharmacological findings. First, we show similar effects to those first reported with the HCRTR2 antagonist TCS with two additional antagonists (Suvorexant and EMPA; Figure 2). Second, we show that an Hcrt agonist (YNT-185) reduces sleep in surface fish (Figure 2—figure supplement 1). Third, we show that morpholino treatment restores sleep to 4 dpf Pachon cavefish (Figure 4). Fourth, we use mosaic silencing of Hcrt neurons through transgenic expression of botulinum toxin restores sleep in cavefish (Figure 5E). We have added the control data to Figure 1—figure supplement 1. While both primer sets have previously been published in A. mexicanus, the current manuscript exclusively standardizes against gadph (Beale et al. 2013; Stahl and Gross 2015, see response to reviewer #1). Additionally, we have reported the M-values in the Materials and methods section, both of which fall well within the desirable range for quality housekeeping genes. We have enhanced the contrast of the images in question to demonstrate that indeed the entire neuromast system is ablated with this concentration of gentamicin treatment. These findings are also supported by previous literature (Van Trump et al. 2010; Yoshizawa et al. 2010, 2013; Jaggard et al. 2017) indicating complete ablation of neurons with gentamicin treatment. We believe it appears that there are more cells because of their brightness, and that closer inspection during quantification suggests they are equivalent. It is worth noting that these images represent a single 2 μm optical imaging section in order to better highlight single cells, and therefore does not offer a full view of the entire HCRT system of the hypothalamus, which is in the range of 500 μm in adult fish. We have enlarged the images in question as much as space allows and hope this accurately represents our findings. While there do seem to be regions in which antibody labelling is stronger or weaker, we did not see a trend in conserved nuclei expressing these changes among biological replicates, and can most likely be attributed to slight variability among animals and/or staining quality in replications. Moreover, we have quantified fluorescence intensity among individuals, and we present the variability in the error bars in Figures 3 and 4. Thank you for noticing this omission. We have now clarified that analysis is limited to exons. Thank you for noticing this oversight. Indeed, the Bilandzija study was one of the findings that pointed us towards studying Hcrt and has now been appropriately added to the Discussion. We have corrected the typos/minor errors in the original version. […] Given the conserved role of HCRT in sleep regulation in different species, the conclusion of this study seems logical and expected. However, their experimental results are insufficient to support this conclusion. The difference in hypocretin neuron cells numbers between these two species are clear, yet beyond this correlation the evidence that the study provides attempting to causally link HCRT and sleep loss is weak. 1) The authors draw their conclusion based on three experimental manipulations- pharmacological manipulation of Hcrt receptor 2, lateral line ablation using gentamicin, and starvation. The only "specific" manipulation for Hcrt system is the pharmacological manipulation using TCSOX229 (TCS). The authors cite Plaza-Zabala et al. 2012, which shows the application of this HCRTR2 in mice. A big issue in this study is that there is no control to show that the application actually affects hypocretin neurons in zebrafish. What is the half-life of TCS in water? How do we know that TCS is selective for HCRTR2 in zebrafish? The protein sequences of HCRTR2 in zebrafish and mouse are different and what is the evidence that TCS is a specific HCRTR2 antagonist in zebrafish? Even if this has been shown elsewhere, the authors need to demonstrate that it works in their lab in the context of this study as well. For example, the authors could show altered activity of cells expressing HCRTR upon TCS treatment using c-fos, p-ERK staining, etc. Also how is the dosage determined? We appreciate this suggestion and have now acknowledged the limitation of pharmacological agents in this system (for example, Discussion, second paragraph). We currently do not have the genetic tools to examine Hcrtr2, though we are actively working to generate them. We have also initiated a collaboration (inspired by this suggestion) with Laura Bohn at Scripps to examine the effects of the drugs used in these experiments on zebrafish and A. mexicanus HCRTR2 signaling. While we are eager to include these experiments, they are not trivial, even with support from the Bohn lab, and we therefore hope they are not essential. We have instead used additional drugs, genetic approaches, and morpholinos to fortify the conclusions. In particular, the genetic knockdown of hcrt and genetic silencing of HCRT neurons promoting sleep demonstrate that the relationship between HCRT signaling and sleep differences in cave and surface fish are causally linked. While the genetic tools in cavefish are not at the same standard as those in zebrafish, we are highly committed to transferring zebrafish genetic technology to cavefish and are collaborating with a number of zebrafish labs to efficiently implement transgenesis and gene-editing. We hope that future endeavors from our group will include this level of resolution. What is the evidence that TCS actually penetrates and reaches the hypothalamic hypocretin neurons when supplied in bath water at this concentration? In mice TCS is administered by IP route in a volume of 5 mL/kg body weight. In this study the TCS doses were based on a pilot experiment testing the effects of this antagonist on the hyperactivity induced by hypocrein-2 in C57BL/6J mice. A similar experiment using hypocretin overexpression or knock out could be done to determine the effective concentration. While the ability of drugs to cross the blood-brain-barrier has not been tested in fish, a number of the HCRTR2 modulators reportedly pen0etrate the brain of rodents. We have now stated our justification for drug selection (Results, fourth paragraph). We initially selected our concentration based on those previously used to study sleep drugs in zebrafish (Rihel et al., 2010) and our studies in cavefish (Duboue 2012). In addition, the drugs used were prohibitively expensive at higher concentrations, particularly for adult studies. We acknowledge that without understanding receptor pharmacology in our system, this is effectively an educated guess, though our approach is based on precedent set in studies in zebrafish. We have also bolstered our findings using complementary approaches. Thank you for this suggestion. While we have not been able to overexpress Hcrt, we have tested an HCRTR2 agonist that reduces sleep in surface fish (Figure 3—figure supplement 2). In addition, we have found that morpholinos and mosaic silencing of Hct restore sleep to cavefish. We fully recognize that none of these experiments by themselves are optimal. However, both approaches represent a technical advance for our field. For example, the use of morpholinos required measuring sleep in 3-4 dpf fish, which had not been performed. In addition, the UAS-Btx experiments represent the first use of GAL4/UAS in A. mexicanus. These experiments have inspired us to generate additional tools (such as Hcrt:GFP and nfsb lines), however, the analysis is not ready to be included in this manuscript. We fully agree and have added discussion of this (Discussion, last paragraph). We do not mean to suggest that Hcrt alone regulates sleep loss in this system. Rather, our conclusion is that the evolution of Hcrt function contributes to the evolution of sleep loss in this system. We are addressing this in our current work in a number of ways including a collaboration with the Appelbaum Lab to examine Hcrt-associated circuitry in zebrafish and A. mexicanus. Again, these experiments are challenging in both systems, and we are unable to incorporate it into this manuscript. In addition, we are eager to examine the evolution of known sleep genes (in flies, zebrafish, and mice) as well as genes identified through our ongoing QTL mapping efforts. We describe these efforts in the Discussion. In the original version, the main panel was in adults, while the supplemental was in fry. In the revised version we have taken care to label and describe figures more clearly. This work was funded by National Science Foundation Award IOS-125762 to ACK. The authors are grateful to Masato Yoshizawa (Hawai’i) for technical guidance and the Department of Comparative Medicine at FAU for support maintaining the fish facility. Animal experimentation: This study was performed in strict accordance with the recommendations in the Guide for the Care and Use of Laboratory Animals of the National Institutes of Health. All of the animals were handled according to approved institutional animal care and use committee (IACUC) protocols (#A15-32 and A16-04) of Florida Atlantic University. The protocol was approved by the Committee on the Ethics of Animal Experiments of Florida Atlantic University (#A15-32 and A16-04), and all experiments were performed with oversight from FAU's Department of Animal Medicine. © 2018, Jaggard et al. Esteban J Beckwith et al.